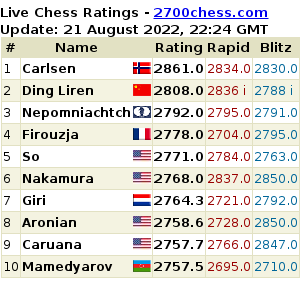 Now two Chinese players lead the competition: Ju Wnejun and Ruan Lufei. Lufei outplayed Lilit Mkrtchian. Round 4 will be held tomorrow at 15:00 MSK Time. The 4th round of the Women's Grand Prix has finished several minutes ago in Jermuk, Armenia. 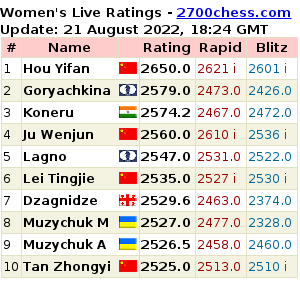 Ju Wenjun outplayed her compatriot Ruan Lufei and now she is a point ahead of Hou Yifan and Humpy Koneru who finished their game in a draw. None of the games of Round 2 of the Women's Grand Prix, which takes place in Jermuk, finished peacefully. Most of the Asian players were successful: Hou Yifan outplayed Lilit Mkrtchian, Ruan Lufei - Batkhuyag Munnguntuul, Ju Wenjun - Danielian, while Humpy Koneru crushed Nino Khurtsidze playing white for the second time in a row. The duel between the challengers for the second place in the Grand Prix 2012/2013 has finished. Let us remind you that the 2nd overall place gives the winner the right to challenge the World Champion Hou Yifan, which will be held next year - in the case if the champion will also win the Knockout Championship 2012. Round 8 of the French championship has recently finished and instead of four leaders there is only one now. It's Maxime Vachier-Lagrave, who managed to overtake Anatoly Vaisser in a hard struggle. Vlad Tkachiev and Etienne Bacrot made a quick draw, while Laurent Fressinet gave up to Christian Bauer. Thus, Bacrot, Bauer and Tkachiev are the closest rivals of Vachier-Lagrave. The first round of the Ukrainian Championship has been played in Kiev. Three out of six games ended with decisive results. Alexander Moiseenko, Andrei Volokitin and Anton Korobov got a point each to their name. The fifth stage of the Women's Grand Prix in Jermuk is nearing the finishing line. In contrast to the other stages, for some reason the participants were given only one free day mid-way through the tournament. It's possible that the fatigue is influencing the content of the games. One way or another, two out of three of today's wins were due to participants' one-move blunders shortly after the opening. Kateryna Lahno and Zhao Xue took the advantage of mistakes by Humpy Koneru and Lilit Mkrtchian, respectively.